TOP Year 2023 . 12 Mins Walk to MRT . 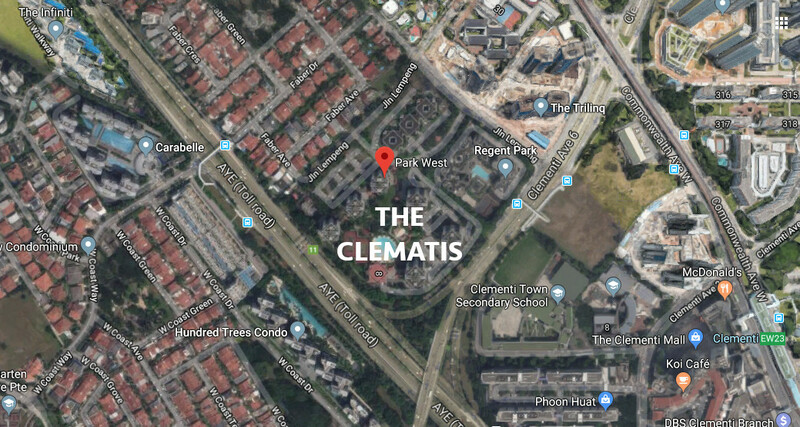 The Clematis condo is a huge new 25-storey high residential development at Jalan Lempeng in the Clementi area. It is being built on the site of the former Park West condominium. This is one of the few new condominiums in the Clementi area within walking distance of Clementi MRT station, and next door to a highly regarded primary school. The immediate locale of the Clematis condo is actually in an exclusively private residential enclave, comprised mainly of the landed houses of the Faber Hills Estate, and a couple of other private condominiums. This location is promising, sitting as it does directly between Clementi Town to its east, and the Jurong Lake District on its west. Clementi is known as the tertiary education belt of Singapore, extending to the research hubs and science and business parks of One-North. Educational institutes include the sprawling campuses of the National University of Singapore (NUS), the medical hub at Kent Ridge, a couple of polytechnics, and several brand name local and international schools. On the other side, work is in progress in build up the Jurong Lake District (JLD) into the 2nd Central Business District (CBD) of Singapore. Several statutory boards and MNCs plan to move their offices here. Along with that will come jobs, and demand for accommodation. The best capital appreciation potential is found more in areas on the cusp of development, than in fully developed areas. The Clematis condo looks like it could ride on the back of the Jurong Lake District development. The Clematis condo should suit families very well, especially those with young children. For a start, it is on the doorstep of Nan Hua Primary School, which caters to both boys and girls. Your child could literally walk to school within 5 minutes, door to door. Think what that means in terms of more rest and study time! That goes for the adults too. Being on the edge of the 2nd CBD of Singapore, as well as not too far from the Raffles Place / Marina Bay Financial Districts means more job opportunities, and less travel time, less jams to contend with. In fact, Clementi station is on the East-West MRT line, that leads directly both to Jurong Gateway, as well as to Raffles Place and Marina Bay. 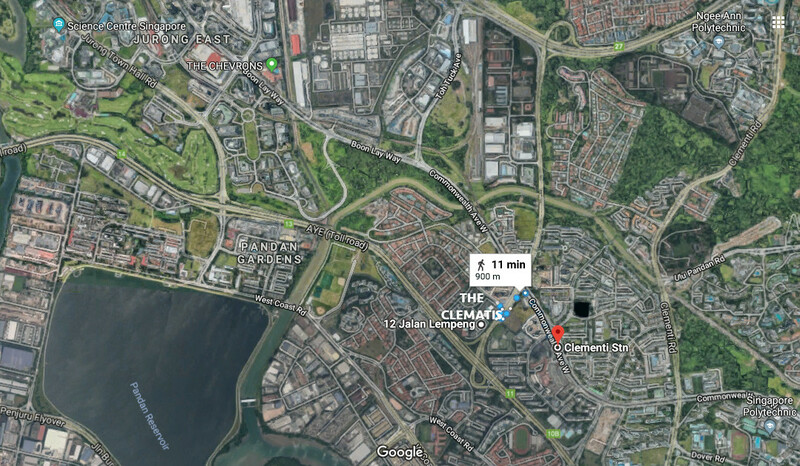 Currently it takes around 11 minutes to walk to Clementi MRT station, according to Google Maps. But in future, once the HDB precinct across the road is fully built, a short cut could open up that will shave some of that walking distance to some 6 or 7 minutes. The site was formerly occupied by Park West condominium. The developer SingHaiyi successfully tendered for it in a collective sale in January 2018. This neighbourhood is a mature estate well served by all the necessary amenities, including supermarkets, banks, shops, F&B outlets, transport nodes, and sports and swimming complexes. With a land plot ratio of 2.1, the Clematis condo will be a 25-storey high development. It won’t be as tall as Trilinq on its north (plot ratio 2.8), but taller than Hundred Trees to its south (plot ratio 1.6). This gives rise some interesting possibilities, as it means residents will get open views at higher floors towards the south, in addition to views to the west over the low-rise landed houses on that side. The only drawback for units on the south of the site is the traffic noise of the Ayer-Rajah Expressway. However the blocks further in won’t be affected, so it helps to come in early for this project. The Clematis condo floor plans are pending approval by all the relevant authorities. Please drop us a note via the Contact Form if you would like the Clematis floor plans to be emailed to you when finalised. The Clematis site is huge, spanning over 630,000 sq ft. It is a roughly square shape with one corner cut out by the neighbouring Regent Park condominium. Stretching for quite a way to its north-west, is the older landed housing estate of Faber Hills. The Clematis condo apartments facing this side will get the west sun. But higher floor units will also get unblocked views over the low-rise houses. The units facing north-east will either get views over part of the landed estate, and Nan Hua Primary school, or towards Regent Park or Trilinq. So while the views are this side are not so good, they do not get the west sun either. To the south-east across Clementi Avenue 6, the Clematis condo overlooks Clementi Secondary School towards Clementi town. Not much views directly, but some views to the south. Again, no west sun. Those apartments fronting the Ayer-Rajah Expressway on its south-west boundary, will bear the brunt of the traffic noise. However the architects will take steps to mitigate the worst of the noise. The high floor ones will likely have the best outlook, and might even get views to the sea off the west coast of Singapore.